Looking for a healthy pancake recipe? We have the best 100% whole wheat pancakes for you. These are totally delicious and healthy pancakes. 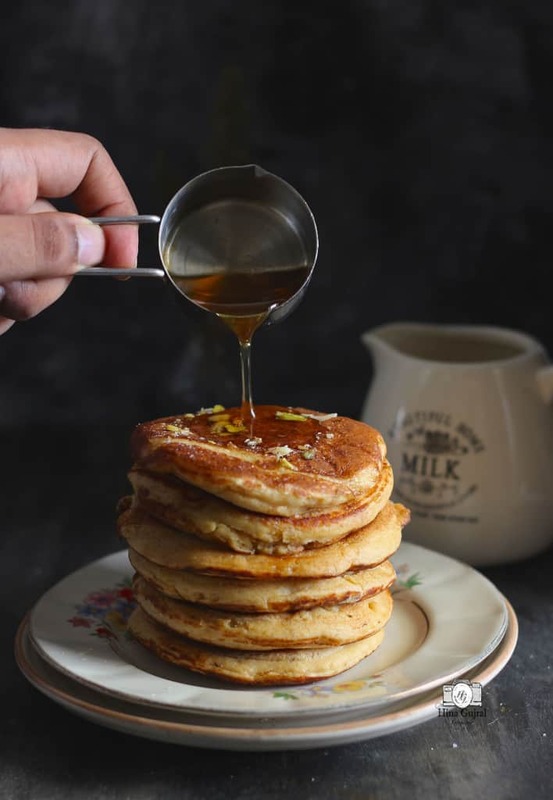 These whole wheat pancakes are fluffy, soft and super healthy.Serve them with a drizzle of organic honey or maple syrup with some fresh fruits and a wholesome breakfast is on the table in less than 30 minutes. Whole Wheat Pancakes are always my brunch-time favorite. They add a great variety to the breakfast table. And loved by each member of the family. Needless to say, kids in the family love them to the core. 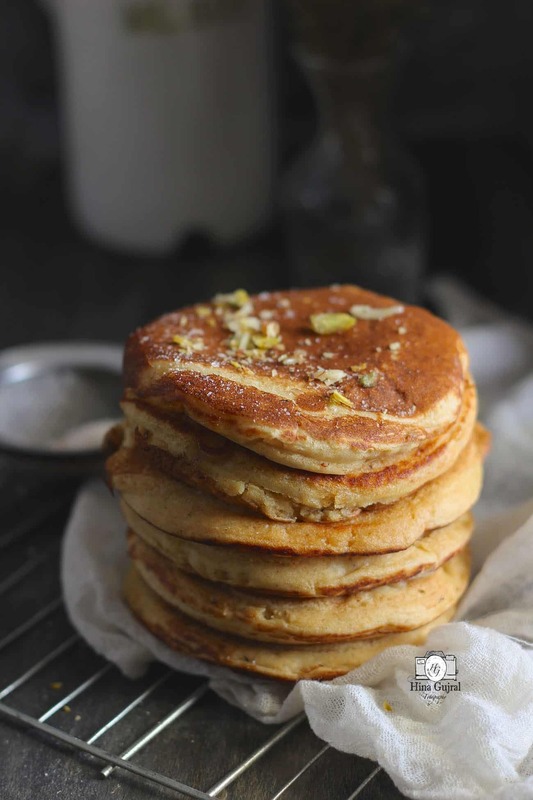 With all the whole wheat flour in the recipe, these pancakes are quite pillowy with an earthy taste to them. 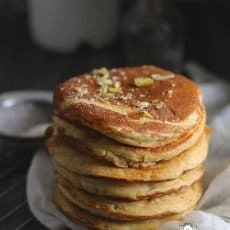 No one can ever tell with one bite that these pancakes are prepared with whole wheat flour. 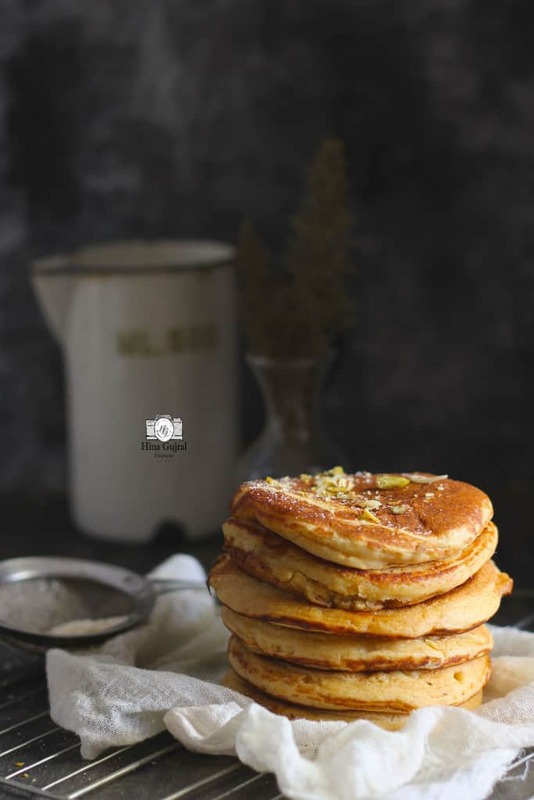 In case, you are assuming that whole wheat flour might compromise the taste of the pancakes then you must try this recipe. I like my pancakes thick, maybe because crepes are so not my thing. But if you prefer thinner pancakes then add little more milk to the batter. The batter for these healthy pancakes is on a lumpy side. So while folding the ingredients together do not try too hard to smoothen out the lumps formed, else result will be flat and chewy pancakes. If you are in a mood to go for little calorie splurge than add chocolate chips to make whole wheat chocolate chip pancakes. Even the addition of fresh chopped berries (blueberries, strawberries etc) to the batter is also a great idea. TIPS TO MAKE PERFECTLY DELICIOUS WHOLE WHEAT PANCAKES? To prepare the buttermilk, use the room temperature milk. And make sure all the ingredients for the pancakes are at room temperature. Cold ingredients make the texture of the pancakes bit tough. Do not mix the batter for too long. Else, you might end up in chewy pancakes. The moment all the ingredients are combined well and no streaks of flour remain in the batter, stop mixing. Allow the batter to rest for 5 minutes before making the pancakes. Be assured this trick will always yield soft and fluffy pancakes. Let the air bubbles appear on the surface of the pancakes while cooking then only flip it to cook from the other side (you can see the same in the video as well). drizzle a good quality organic honey over the piping hot pancakes and serve them immediately. a tablespoon of butter followed by the drizzle of honey. a good drizzle of natural maple syrup. honey and fresh seasonal fruits/berries. Whole Wheat Pancakes is always my brunch time favourite, served with a variety of fresh fruits, a drizzle of organic honey. Learn how to make perfect healthy pancakes at home. To prepare the pancake, first prepare the buttermilk. In milk stir vinegar or lemon juice, let it sit at room temperature for 5 - 10 minutes. You will notice milk will cuddle. This is the buttermilk you require for the pancake. Next sift together flour, baking powder, soda, salt, brown sugar in a mixing bowl. Whisk together in a separate bowl egg, buttermilk, olive oil and vanilla essence for 5 minute or till combined well. Now make well in the centre of the flour mixture, add the liquid ingredients and gently fold till all combined well. No streaks of flour should remain in the batter. Let the batter rest for 5 - 10 minutes. Heat non stick pancake pan ( buy it here ) over medium heat. Grease it with a teaspoon of butter. Pour a large spoonful of batter in the pan. If the batter is not spreading around, gently spread it with the back of the spoon. Sprinkle chocolate chips over the pancakes. Cook on one side till air bubbles appear on top and edges turn brown. Flip the pancake and cook from the other side. Similarly, cook the remaining pancakes. Serve the Whole Wheat Pancakes with a drizzle of honey and butter. You can serve pancakes with fresh fruits. Do we need to powder the brown sugar? I have found granulated brown sugar little hard to dissolve. There are two types of brown sugar available in market: 1) light brown in color and fine powdered in texture 2) dark brown with grainy and sticky texture. For muffins, pancakes and pies we prefer first one and for crumbles and other coarse texture deserts we prefer second one. Granulated white sugar can also be used. Hina dear whc food processor u recommend for chopping?